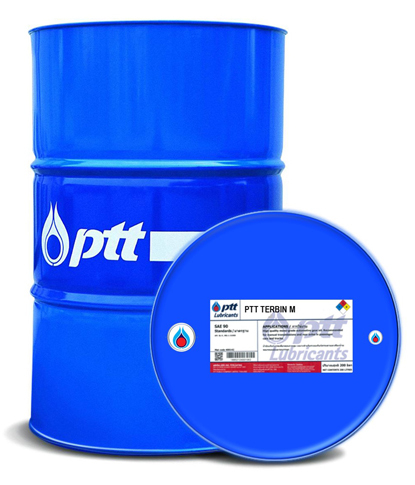 [PTT TERBIN M] น้ำมันหล่อลื่นเทอร์ไบน์คุณภาพสูง ที่ผลิตจากน้ำมันพื้นฐานที่ผ่านกระบวนการปรับปรุงคุณภาพด้วยไฮโดรเจน (Hydrotreated) ทำให้มีอายุการใช้งานยาวนาน พร้อมทั้งมีค่าดัชนีความหนืดที่สูงเป็นพิเศษช่วยปกป้องเครื่องจักรได้ดีทั้งในสภาวะอุณหภูมิต่ำ-สูง Premium industrial turbine oils that were formulated with high technologically hydrotreated process to improve oil drain intervals and drastically enhance viscosity index which can maintain viscosity grade even in wide range temperature condition. They also provide unique ability for water demusibility and low foaming formation and offer excellent wear protection together with sludge and varnish prevention. • Suitable for industrial steam or gas turbines operating under high temperature condition especially turbines from Mitsubishi. • Can be recommended for water turbine lubrication. • Various application where excellent varnish protection along with rust and oxidation prevention are required. • Superior thermal and oxidation stability which minimize sludge formation and give machine longer service life. • Excellent protection against rust and corrosion on metal surface. • Outstanding water separation where water environment is unavoidable. • High viscosity index which provide sufficient film thickness over wide temperature range.